Liverpool boss Jurgen Klopp has confirmed that Dejan Lovren, Joe Gomez and Alex Oxlade-Chamberlain will play no part against Man Utd on Sunday. The Reds face a huge challenge in their bid to end their wait for a Premier League title this weekend, facing a resurgent United side at Old Trafford. 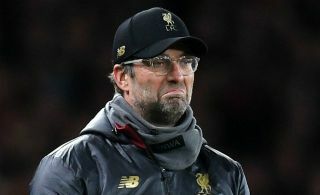 A win would move Klopp’s men three points clear of title rivals Man City with both sides then having played the same number of games, and that in turn could give them real belief that they can go on and win the title this season. In contrast, a defeat would raise further question marks and nerves, with the Merseyside giants already slipping up against the likes of Leicester City and West Ham United in recent weeks. However, there are no new injury concerns for the German tactician it seems, as Gomez and Oxlade-Chamberlain remain sidelined as long-term absentees, while Lovren is still out with a hamstring problem, as per freelance injury analyst Ben Dinnery’s tweet below following Klopp’s press conference on Friday. Virgil van Dijk will return from suspension after missing the midweek encounter with Bayern Munich in the Champions League which will be a major boost for Liverpool, but they’ll hope that their preferred attacking trident and reinforced defence will be enough to get a crucial victory over United. The Red Devils have been resurgent in recent months under interim boss Ole Gunnar Solskjaer, who himself hinted at a possible double injury boost this weekend with Jesse Lingard and Anthony Martial potentially in contention to feature, as per BBC Sport.